Several dozen activists held a candlelight march tonight in Ferguson after the shootings yesterday in St. Louis. Yesterday, Mansur Ball-Bey was shot in North St. Louis after pointing a gun at police and 9 year-old Jamyla Bolden was shot when she was studying on her bed in Ferguson. The kids came out tonight. 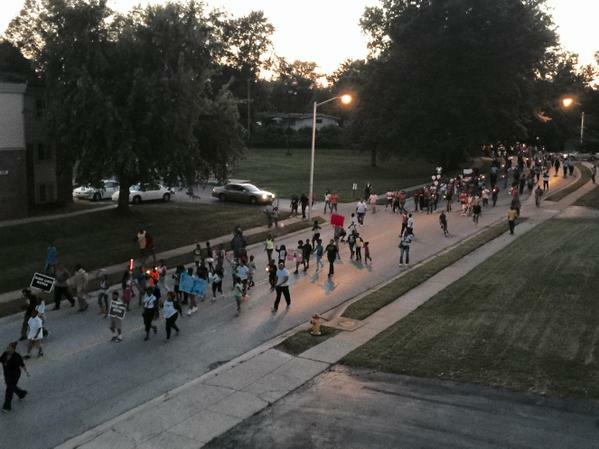 Children and parents held a peace march in Ferguson tonight. The march was also for Jamyla Bolden who was shot dead in a drive-by this week in Ferguson while she was studying on her bed. Tonight the #BlackLivesMatter protesters held a march in Ferguson. They ended the march on Canfield Drive where Michael Brown was shot dead after he attacked a cop.